Road and street networks are so often analysed and assessed regarding their automobile connectivity, that we forget about their function in supporting the street life that surrounds them. Tāmaki Makaurau Auckland is intensifying. In particular our city centre is no longer solely recognised as a business district, but also a central community where families live. Both the increased connectivity to the city by public transport, and its new role as a neighbourhood means that the dominance of its roads as a private car network is becoming increasingly irrelevant. Unfortunately, those who suffer from these networks maintaining their predominance, are society’s most vulnerable. Every week, one person dies and 14 more are injured on Tāmaki Makaurau Auckland’s streets. Yet, the public has become so acclimatised to this, that mobility-based backlash only occurs when someone needs dental work after a Lime scooter incident. Teaching road safety to children now requires waiting 3 extra seconds for cars running red lights. Crossing during a green man signal is already far too short for little or fragile legs. 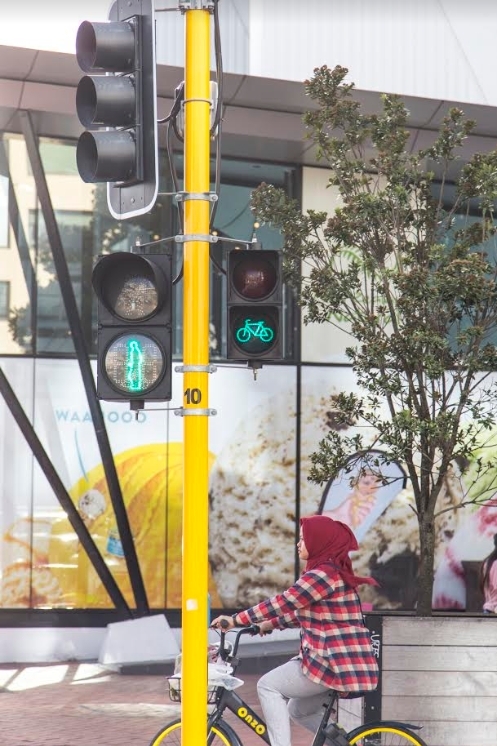 This is why we at Women in Urbanism are campaigning for slower speeds for safer streets as Auckland Transport enters public engagement in February. The inequity in the way Auckland builds its streets is blaringly obvious to those who choose not to drive. Car dependence is a choice, however for some reason, in 2018, Auckland’s road network still chooses to accept it as the default position. Our city’s intensification and social well-being demands that this stance is changed. 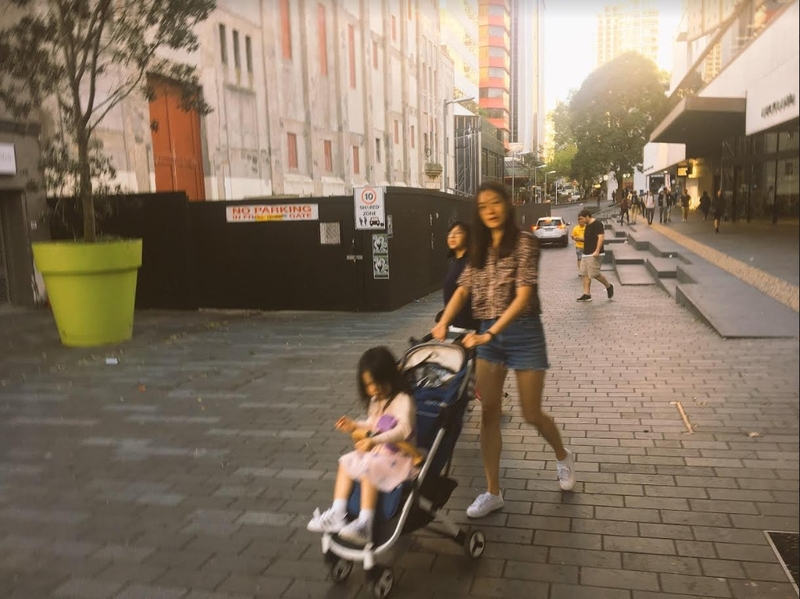 One component of Auckland Transport’s consultation will be the subject of speed limits, and Women in Urbanism would like to fix their current approach and make sure that staying alive is a priority. Statistics show that women walk more than men, take more regular short trips and that men are more likely to drive. Therefore, car prioritisation makes our road networks inequitable. Within these statistics, the more vulnerable users from minority groups suffer even greater. When cars command our streets, independent mobility is diminished, instead endorsing lifeless, unsafe and inactive transport options. To ensure a greater diversity of voices are heard during Auckland Transport’s consultation period, we ask that you add your insights through our survey at this link. The louder that we can challenge commonplace ideas of who streets belong to, and whose safety and accessibility is prioritised, the sooner we can prompt action. Please join us in our fight as we begin our campaign in preparation for consolation. As our urbanista hero Jane Jacob’s once said, “cities have the capability of providing something for everybody, only because and when they are created by everybody”. So many fronts we need to attack these problems. 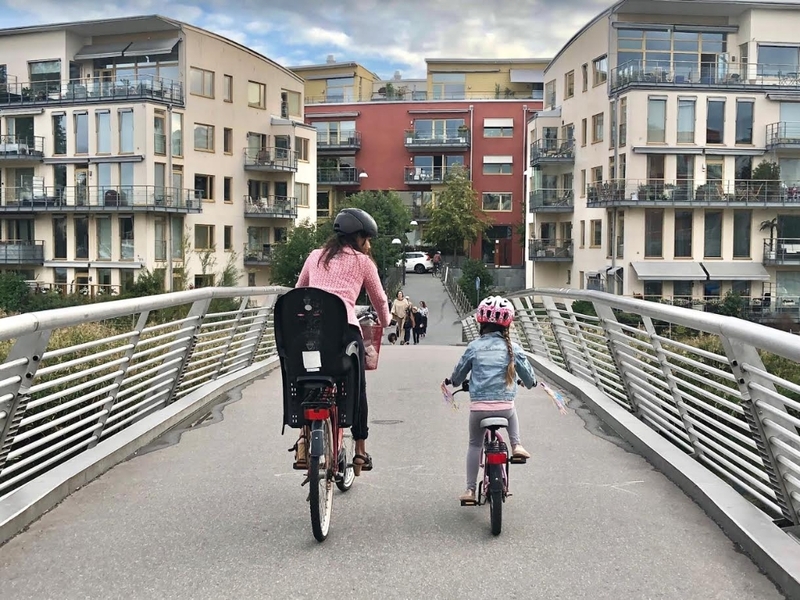 I keep asking for a city designed for children – it will solve so many problems. many (like, 50) intersections throughout the city centre require pedestrians to cross more than 5 lanes wide – that is at least 20-25m. Some are up to 43m wide (Nelson/Fanshawe)! A fit person can cross this in 30 seconds, while a ‘slow’ user (child, elderly etc.) would take almost 55 seconds. Beyond that, there is a culture problem – the red light running across the top of Nelson (often so late they push *through* groups of primary school kids on the crossing) and the always creeping forward at red arrows/pedestrian phases, hurrying women with children (and everyone else, but slow users get it worst) to get out of their way so they can zoom off to the next red light. Assuming that people are willing to curb their aggression and impatience for women, children, the disabled and the elderly is incorrect. We need to take strong action to prevent this behaviour, as it won’t solve itself. Maybe a “drive safe” campaign akin to the stupid ‘scoot safe’ one where we remind everyone of their basic responsibilities in society. I discovered the other day that the crossing distance, as defined in NZTA’s Pedestrian Design Guide, is calculated as the kerb to kerb distance MINUS any parking zone width. So in the calculation of travel times and delays to pedestrians, they assume that children (and people with walking frames, accompanying kids on trikes, the full works) have to go out to the outside edge of where parked cars would be, (even if there aren’t any), before their crossing time is calculated. I wouldn’t mind feedback from practitioners if this the practice that is followed. It could certainly be one of the systemic issues that has resulted in such a poor pedestrian network. Another one that comes up over and over again is that rule that pedestrians should wait at most 30 seconds on average. I don’t know even a single intersection which makes even 1 minute — including signalized pedestrian crossings. Note the missing pedestrian leg on that same intersection between Lightpath and the footpath on the east of Nelson Street. I think that is still not fixed. AT need to fix that whole bloody intersection. The strength of the research available at the time – about public health, safety and access issues pertaining to the design of an intersection linking a key cycleway into the city streets – suggests to me that the decision making was at a criminal level of negligence. 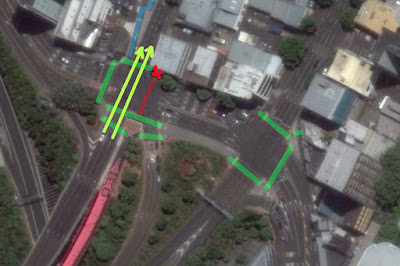 The green arrows: this is the traffic flow when the off-ramp from SH1 has green light. This traffic is not allowed to turn right. The red line is the missing pedestrian leg. Note that you can actually cross along this line. By definition no traffic crosses this line as it would conflict with the green arrows. Even with no downside to Traffic Flow at all, sometimes we still can’t have our crossings. They have changed the phasing recently so I’d have to check if it still applies. The pedestrian leg is definitely still missing! Yes, please please please, this! And the sooner the better. Good luck and great work. Thanks Miriam. The outcome of 30 km/hr speed limits in the city centre will be enormous, not just for safety but for public, social and environmental health outcomes. There are too many international successful examples to ignore. Can’t find an email address to inform them directly, but numerous questions on the survey seem to be broken. E.g. “Do you feel safe on Auckland Streets” the ‘other’ option cannot be selected. The following question asks you to select from a drop down list, but there is only one option on the list and the sentence ends abruptly. Perhaps a draft version of the survey was uploaded? Add to that: Requiring your email address without disclosing how it will be used. Argh apologies – thanks for bringing this to our attention. We have had some teething issues and it looks like the all is not fixed as we’d hoped, will try and sort the problems. The change to slower speeds requires AT to recognise the value and safety issues facing pedestrians of all types. Slower speeds makes city streets quieter, easier to spend time and talk. Good for street fronting businesses. Does AT factor this into their decisions when upgrading a street ? If AT agree on the speed reductions, it then becomes a street design and enforcement problem. Wide roads that encourage speeding will need to be narrowed, and we will need more speed / red light cameras. Street design: will be necessary at some point, but it doesn’t have to come first. Don’t underestimate the effect of a simple speed limit change. Research shows it does have an effect on speeds even without any street redesign or enforcement. NZTA research shows there is strong suppressed demand for slower speeds. Once people feel ‘allowed’ to drive more slowly, they will, and that will reset the driving environment. These streets are likely to quickly see safer speeds from drivers, because there is little point in speeding up to 50 km/hr just to get to the next red light. The average speed is 19 km/hr anyway – making it illegal to go above 30 makes it very clear that the acceptable behaviour is to NOT have that burst of pointless speed on short stretches. Why are residential streets being forgotten? I can’t see any reason for our residential street to have a 50 km/hr speed limit. If they lowered it to 40 I doubt it would add more than a few seconds to anyone’s journey. But it would make me feel a lot happier about our kids being out front, about walking, cycling, etc. The current default 50km/hr speed limit needs to be reduced to 40kmh, with 50kmh being the exception on some arterials. And the speed limits need to be policed at the limit (or a small tolerance) – 10km tolerance is too high. Yes. The bulk of roads planned to have lowered speed limits are rural roads. These do need the lowered speed limits, and AT have targeted them, I imagine because of the ‘low hanging fruit’ there – easy winnings with lowered crash and DSI statistics. Or more public support. What they need to realise is that there is at least equal urgency in urban areas. The number of deaths from transport air pollution alone is double that from the crashes. Changing to 30 km/hr in residential areas, so that there is massive mode shift – as well documented overseas – will go a long way to improving air quality. And then there’s the public health outcomes from the increased physical activity, which will vastly reduce premature death. The 30 km/hr speed limit change should have been citywide. It would have been much cheaper to do, would have been much easier to enforce, it would have allowed the cycleway programme to concentrate on areas where 30 km/hr isn’t sufficient or on arterials so they can have higher speeds, and would have brought around the mindshift required in drivers much more quickly. Hopefully this is what the second tranche will be. But how long is that 2nd tranche going to be? It’ll be sooner if we inspire the public with a vision of what our city can be, based on solid research. It’ll be later if the lobbyists against change continue to have a strong voice in our media. To that end, I have a post almost ready on some of the inaccuracies a lobby group has been bandying about. +1. And make it 30 for residential streets. No tolerance. There might still be a downwards “correction” on your speeding ticket, to account for the limited precision of speed radars, not because of tolerance. This is particularly important at intersections. There is no reason to accommodate a lorry to make a turn onto a residential street at 40kph. Turning radii need to be significantly reduced. It really isn’t an issue if a moving truck or whatever happens to encroach on the centreline once per year. These speeds sure need to come down. Good idea even lower around schools. While i agree completely with the conclusions, it’s sad to see the issue has been reduced to the opening of another front in the gender war. This is going to make it harder to persuade the general population – the equivalent of a reverse dog whistle. On another note, how does being “gender non-binary” affect one’s personal mobility? Although it does feel like a convenient selection of statistics. Men for example cycle a lot more than women and cyclists are quite vulnerable to fast cars. Poor cycling safety in NZ is affecting cyclists in terms of injury (men more so than women, because men cycle more than women) and in terms of access (women more so than men, because women feel more restricted than men by the lack of safety). Heidi I completely agree. We definitely do need more input from women and many other parties. The transport network is largely designed by white men. But that doesn’t necessarily mean that it is designed for white men. For example in our household my wife chooses to drive everywhere (nothing to do with safety) while I tend to walk and bike a lot more. I would love a lower speed limit, my wife probably not so much. I’m not that convinced that there is an inequality issue with the current speed limit – it’s screwing everyone equally. No doubt, though the concept that a group advocating making getting around a little easier for women is somehow an attack on men is bizarre. How about also changing the speed limit in the rest of the urban area to be 30kph on any street that does not have a protected bike/scooter lane? You want your arterial to go fast? Gotta build separated infrastructure. Great blog Miriam. I completely agree. It would be brilliant if all residential streets had a 30kmph limit. Your proposals sound workable and would be great for children’s (and everyone else’s mobilities). 30 is ridiculous, 40 would be more than adequate. You’re note going to get any traction from many (regardless of gender) that 30 is sensible. What kind of psychopath doesn’t think that 30km/h is appropriate here? Glenwood Ave I know someone who lives here and 40 is ok. I would agree to 30 in school zones. – retain car dependency and poor physical activity levels. People will adopt walking and cycling in a 30 environment – we have the research to show this. Keep it unsafe – at 40 or 50 – and we keep our public health bill high unnecessarily. 40 isn’t some sort of ‘compromise’. It’s a failure to listen to the research, and a failure to take advantages of what 30 will bring. Why is 30 “ridiculous”? A blunt assertion is no substitute for a reasoned argument. Getting traction from the many: what seems to work the best is ‘trialling’ it citywide, so that the full set of benefits are visible to all. The freedom this gives people to walk and cycle and let their children walk and cycle, and the reduction of all that short trip traffic and chauffeuring traffic, seems to be what means citizens then embrace it. This was happening back in the 90s in more progressive places. We’re now at the stage where the only reason ‘trials’ are needed is for this public perception role. There’s no technical reason why you’d have to trial something that has such strong research behind it. You’re a car hater Heidi, I wouldn’t expect anything less of you when it comes to sticking it to drivers. As for separated protected cycling lanes who is going to pay? No case is cut and dried, their are always pro’s and con’s. Name calling is just demeaning yourself, when you either cannot, or will not, take the effort into putting forward a coherent argument. All infrastructure needs paying for. To determine the best priorities for the always limited available resources is a process of rational research of the available options, discussion and advocacy. Something that goes to the heart of this forum. Name calling has no place in any intellegent discussion. Who is calling anyone names? I’m just stating a fact, Heidi has made her feelings about cars well known. I agree with your recommendations other than around schools. I believe 30km/h should be applied around schools as well. This keeps things more consistent, which should make it easier for drivers to comply.